wasn't this posted on Saturday? thought it was a holiday? That aside i don't know about diamonds, but isn't 10k gold bad? I'm usually told to only buy gold from Libya (18k/24k) is that good advice? also do diamonds add much to the price of a bracelet? Honestly 200 hundred $ is very expensive still for a 1k diamond , this bracelet has many tiny diamonds which all toghether = 1k I assume so it is not very good quality , but it looks pretty. 1K 'good' diamond would be about the size of a classical solitaire (single stone) engagement ring. He he he, my fingers were one click away from purchasing this for you with my credit card. So sorry I had to cancel the process because I don't know your delivery address he he he. Now you know what to do LOL. In addition to converting to Christianity that is because this would be a perfect Christmas present but there's no presents without a feast he he he. Actually, a tank of gas for a car can cost more than 50$ so maybe it isn't considered that expensive in the US? 200 $ is a lot for us here in Libya when I convert it to Libyan Dinars if you calculate that the average salay monthly salary of graduate is 150 $ per month ( be he/she a doctor or teacher) . Yes benzina , in general I think here its not considered much i just used gas because its clearer, but its evident in the difference in salaries and almost everything else. I think the difference in salary and cost of living is nearly proportionate by a factor of 10. Its always good to put thing in context :). Ahhh, that's nothing! Last month I got myself a $220CAD($200US) speeding ticket! ...and I was only 15km over the limit! Just recently, this morning in fact, I've ran into this sort of confusion regarding the relative "value" of money with someone. It's difficult to imagine how one can live on $150/month. My heating bills are $800/month! A decent restaurant meal costs $30, an apple $1.00, a hamburger $2.00, phone bill $70/m.... OMG, and don't even ask about my taxes. $150/day is about what a teacher with several years experience makes here I guess. It would be interesting to know what common necessities or living expenses cost in your area. ehh, I always feel that talking personal finances/money is taboo but my curiosity is getting the better of me. lol, I just realized this is quite a coincidence, yesterday I posted this. Chris, I can't comment about Libya specifically, but I've lived in/visited a lot of countries, and I'd say it's all relative. Cost of living is usually scaled to the average income. What I'm wondering is how in a place like Libya, where there are a lot of foreign workers probably being payed foreign pay scales, how does that effect the local economy? If it does? Or is the number of foreign workers too small to make a difference? Chris yes the relative pices of things in different countries might be an interest topic , thanks for giving me a persperctive. LOL @ your post what a coincidence . Now to answer your question I'd pick the Versace belt over this bracelet even though the bracelet is cute. Wanna know the logic ? because the Versace belt is a real Versace hence worth every $ , while this bracelet is only made of diamond 'chips' + 10K Gold. It was attractive only because 195 $ was more realistic a price for it than 600. Highlander would never wear that :P unless each diamond was a 1k on its own LOOOOL . Programmer_Craig :P you're right this bracelet is not really me he he he . That would make a great topic! I really have no idea about these things in your area & the ME. Seems to be one extreme to another with a very large separation of classes. oh yes, I realize that the cost of living for the most part is fairly proportional to income but what about imported commodities? For example technology & computers? Three months wages for a low end computer? That's a difficult situation! What about the cost of travel or a foreign education? A car? "Chris yes the relative pices of things in different countries might be an interest topic , thanks for giving me a persperctive." Highlander, Check out this web site for a comparison in cost of living between various US cities. You can convert your own yearly salary to US dollars and plug it in to see how you would do in any given city. 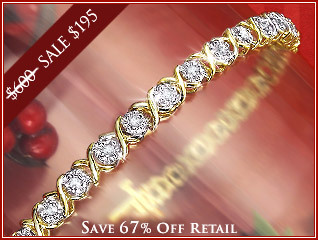 Diamond tennis bracelets has to be very good quality diamond for it to be attractive. I would go for your traditional pieces over this any minute highlander. I'm told that the cost of living in houston is much better than many other US cities. "I'm told that the cost of living in houston is much better than many other US cities." Correct Twosret, one of the many reasons why I live here. First of all Craig, I agree with you (! ), this is not so much Highlander. Perhaps it is more like Red? As for that advert, 67 % off ? I have no idea of diamond valuations but that kind of fishy discount always makes me suspicious. If they work with such discounts how fair are their regular prices? And if their price aint fair how can you trust such people. A kid tried to sell me a (rather nice) collection of exotic spices for (corresponding to) 15 USD. Ridiculous: then he kept following me, decreasing the price until he reached 2 USD ! Then I got really angry with him and made sure he left me alone. If he had offered 2-4 USD from the beginning I might have bitten. I have no problem with bargaining, but an 800% surcharge is not bargaining it is a plain insult. I’d rather burn my money than give it such people. Well LW you better learn quickly! I agree with PC, and I love the ring. It is gorgeous. Chris in MB :) I agree, cost of living in various places would make a great topic for a new post. Programmer_Craig 820, 000 $ whaaaaaaaaaaat ? does that come with a swimmming pool 10 underground garages, watchman, housekeeper, gardener etc... ? Adam :) yes the dainty bracelet is more Redenclave's style , as she is such a delicate lady. Like you I hate hustlers too , thank you for sharing the Cairo story. LW :P don't worry your mum will take care of the dowry procedures if you marry a Libyan, although you might wanna learn as Chris & Adam advices. I'm not sure if swimming pools are the norm or not. There are a lot of swimming pools here, but I don't think they are common enough to be considered standard. Swimming pools don't raise the value of a home as much as one would think, so I imagine if you wanted a pool you'd just tell the realtor that, and you'd only look at houses that had pools. Home prices are crazy in the US these days. I hope they start coming down. A lot! "Pre wall of Berlin fall prices and living in East Europe was so much nicer and quieter I must say. 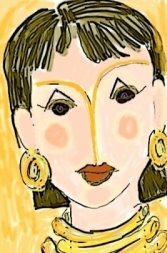 Now the crime rate is horrendous and the prices are driven up up Nomad :("
Diamonds are a girl's best friend , was a song sung in the 60's by Marlyn Monroe. As for the bracelet, it really I believe the price is ok. I think they have a point. I too Highlander love diamonds an don't enjoy gold especially when it's the 21 Karat ,not my cup of tea ! AFirst of all Craig, I agree with you (! ), this is not so much Highlander. Perhaps it is more like Red? H:Adam :) yes the dainty bracelet is more Redenclave's style , as she is such a delicate lady. I'd rather buy property as it's an investment unlike gold, the price depreciates. How much would you get if you're in debt? very little.... so yup, no thanks unless anyone plans to get a beautiful platinum bracelet or ring for me as a gift! regarding the LA property, swimming pool is a waste of space & money & water. You'd have to clean it often. Anyway, LA & NYC are expensive places to live in. But not as expensive as Moscow, I guess...I read that somewhere, must be last few months Reader's Digest edition. H, I am in love with the diamond platinum band which you've linked earlier. Trabilsia , I'm sure you have great taste - I love diamonds but I prefer them mounted on heavier jewelry , oh and the 21 K I adore , ya binti I am your typical shlaftiya girl as my dad's best friend keeps saying while nodding his head in despair LOL. Programmer_Craig 820 0000 is average price ? oh man that's too much and not even a swimming pool etc..
Parts of former Yugoslavia that have not been affected by the war are doing just swimmingly. Not been to Romania. Been to the Czech Republic, Poland and Bulgaria and, at least younger people, are all VERY happy that the communist dictatorships are gone. Czechs are doing great and Slovaks are catching up. Personally I'd say freedom is worth an awful lot and most East Europeans I know agree. In fact for the vast majority of population in countries like Czech Republic level of life has improved dramatically. Same goes for safety - it's much safer without Soviet tanks in the streets or having to go to prison for your political views. BLING! BLING! BLING! - YEAH! Got to have BLING!!! "Curt where is that grocery note and the email :P"
Just sent it H. Sorry about the delay. Years end is always hectic. Let me know if you don't receive it. Schlemazl you are of course right , however I was not talking politics , simply my impression as a visitor. For me it was cheaper and safer that's all. I do understand what you refer to , but also that the Russian tanks were not present 24/7 . It is simply a figure of speech. Khadija do you like the BLING :) ? Soviet tanks were always there on call 24/7 as Czechs, Hungarians and Poles found out when they asked for a bit more freedom. I honestly don't know what safety problems you've exprienced in the Czech Republic recently; seemed pretty safe to me. As for "cheapness", you may find that it's always cheaper for tourists in the third world countries like Africa than it is in rich countries. Trabant is always going to be somewhat cheaper than Mercedes, but it does not mean that you are better off driving one. Politics or not, I disagree with your comment 100% as all my experience of travelling to Eastern Europe tells a different story. Schlemazl , our experiences shape our opinions. Once again I am not begrudging the positive impact of freedom on Eastern Europe I am merely observing that the price of capitalism has brought with it the other plagues associated with it. Comparatively speaking of course it is better now. But the original question which brought this discussion was prices and cost of living. I felt the difference between Dubrovnik now and Dubrovnik pre fall of Berlin wall. But arguing with you is fun and I'm glad that although your blogging is 'lite' you still read and comment on blogs. Hope you had a Happy Hanukkah. Me like the ring too!!! Geez! A $195 very well crafted eternity ring!!! Something I would really like to buy for myself this Christmas. I'm pretty sure they do accept credit cards.